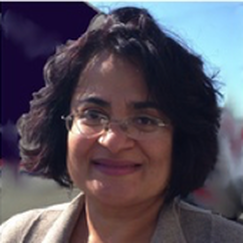 Lakshmi brings to Prerak Trust a strong commitment to social justice issues and extensive experience in not-for-profit governance. She serves as Vice-Chair on the board of Sakhi for South Asian Women, a New York based not-for-profit that serves South Asian women who are survivors of domestic violence. Earlier, she served as Vice Chairperson of the Board of Trustees of the Eden II programs in New York for 6 years, and has over 10 years of Board experience. She is also a founding member of Talking Cranes, an online community for South Asian women. Her career experience includes Human Resource Management in the software industry, and her areas of specialization include organization culture, training and performance management. She has an MBA from the Tata Institute of Social Sciences, Mumbai, India, and an MA in Sociology from the Delhi School of Economics, Delhi, India. She has spent many years consulting for the not-for-profit community, and her areas of expertise are Governance and Development.